I’ve been writing quite a bit about gravity lately, specifically about how astronomical observations confirm general relativity (and Newtonian gravity as an approximation to GR). But there are also cases were things don’t seem to add up. A case in point is the motions of stars in our galaxy. Using the Doppler effect and a few other tricks we can measure the speeds of stars in our galaxy. If you plot a star’s speed vs its distance from the center of our galaxy, you get the result shown in the figure below, which is very, very strange. The dots represent the speeds we observe, while the dotted line represents the speed we expect according to our understanding of gravity. As you can see, the stars far way from galactic center move much faster than we would expect. Something is seriously wrong. Stellar speed vs distance from galactic center. If we measure the stellar speeds of other galaxies, we find the same type of discrepancy. Stars near the core of a galaxy move at the speeds we would expect, but stars far from the center move much faster than we would expect. So it isn’t the case that our galaxy is strange. All galaxies seem to behave the same way. This means that either our understanding of gravity is wrong, or something is causing the stars to move faster. If our understanding gravity is wrong, then it can only be wrong on a galactic scale. We have seen that Newtonian gravity and general relativity work exceptionally well on the scale of our solar system, and it also works for binary stars, neutron stars and even other solar systems. One model that tries to take this into account is Modified Newtonian Dynamics, or MoND. The MoND model proposes a very small extra bit of acceleration due to gravity, about a tenth of a nanometer per square second. 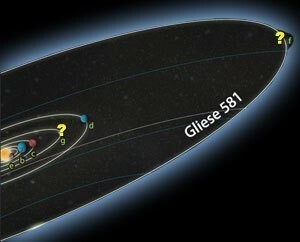 This extra term would be so small that we’d only notice it on the galactic and cosmic scales. If you calculate stellar speeds using MoND, you can get the theory to match observations pretty well. The alternative is to suppose that something else must be going on. If our understanding of gravity is correct, then there must be more matter in the galaxy than we think. But this matter can’t be regular matter. If it were stars or gas or dust then we could observe it. This extra matter must be something that doesn’t emit light or block light. It must be an invisible form of matter known as dark matter. Dark matter seems like a crazy idea. To fix our broken model, let’s introduce an invisible something that can’t be regular matter (protons, neutrons, electrons), but otherwise still acts like regular matter. But it isn’t any more crazy than adding an extra acceleration term just to fit observation. So how could we test either of these models? It turns out there is one way in which MoND and dark matter models differ. Since MoND proposes an extra term to gravity, the center of mass for a galaxy should be the center of mass we observe. In the dark matter model, the distribution of dark matter can be different than the distribution of regular matter, so the two types of matter can have different centers of mass. 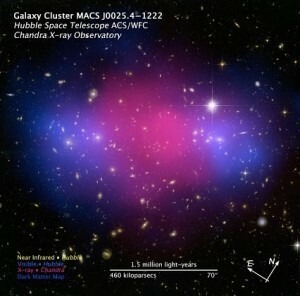 It is this latter case that has been observed in a colliding cluster of galaxies known as the Bullet Cluster. (You can see an animation of this collision here). Dark matter it is. There have been proposed corrections to MoND to account for the Bullet Cluster observations, but so far it looks like dark matter is real. By latest estimates dark matter makes up about 27% of our universe. Of course the big mystery is what dark matter actually is. We know it isn’t regular matter. It has to be something different. I guess you could say we’re still in the dark on this one. 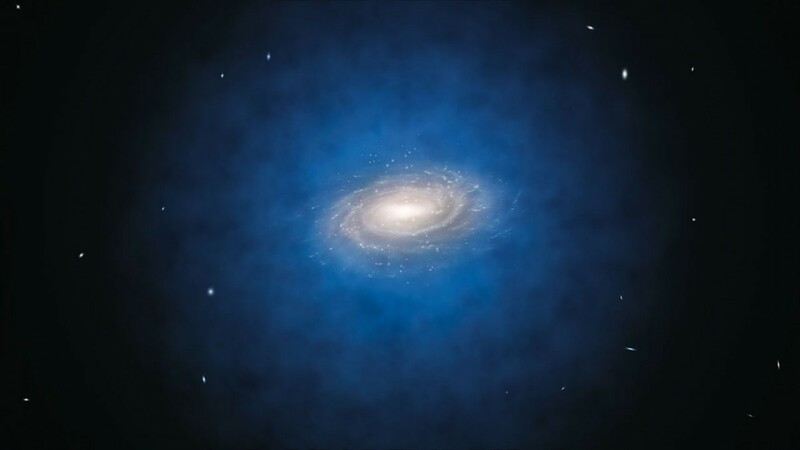 Do you think that the Dark Matter might be a thing in a ‘higher’ dimension and only interacts through gravity with observable universe ? In this case, if gravitons will be discovered they will be multi – dimensional particles – i think. Would you have any thoughts about this theory ? There are models that propose some kind of higher dimension or parallel universes as a way to explain dark matter, but they are very speculative. And of course we have absolutely no evidence for higher dimensions or parallel universes. The subject has always been approached in terms of redefining matter, by introducing dark matter. Matter has gravity. We observe more gravity in a galaxy than matter, so we must conclude that there is more matter than observed. The matter we don’t see is the “dark matter”. I suppose you could pursue a mathematically equivalent line of thought that redefines gravity instead. But its not just more, it’s with a different distribution as well. “the stars far way from galactic center move much faster than we would expect” Is this like a line of figure skaters holding hands spinning around in a circle? The center is barely moving while the outer skaters are moving at a tremendous speed. there might be a possibility of a body experiencing both linear and circular speeds at once as a vector speed thus the result is a ‘trapped speed’ which might be proportional to shear gravity. And what may course this effect not to be detected within the magnitudes of a solar system, might be the gravitational strength contained. Does dark matter explain the discontinuity in the measured speeds at around 10 kpc for our galaxy? 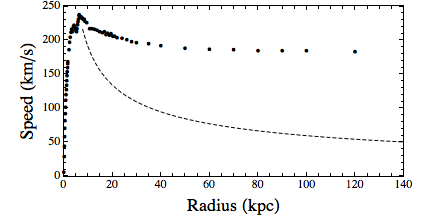 Are there similar breaks in the observed curves for other galaxies? The initial uptick in the graph is due to the fact that the central core of our galaxy is quite dense. After that point dark matter starts to dominate. Understood. However, the discontinuity I was referring to occurs at about 5kpc (just before the point of maximum speed that occurs at about 7kpc) where there is a small decrease in speed as the radius increases, and then speed continues to increase with radius until a maximum speed is reached. There are a number of data points in this region, suggesting that something other than random error is causing this. It could be noise in the data, I’m not really sure. What convinced me to look into this further was that for decades I have wondered how the Valle Marineris could have been formed. Then the electrical sculpting of the surface of Mars hit me like a brick in the face. I began looking into the debunking this theory, and there is nothing there. That made me further convinced that my natural skepticism about dark matter, dark energy, and the big bang theory tied this all together. I think the authorities on this matter are regressing back into mythology. I will continue looking into EU. We know very clearly how Valle Marineris formed. Would you tell us how? I suppose it has nothing to do with ‘electrical sculpting’, right? No, electrical sculpting is nonsense. That was half an answer. Can I guess it was from long-disappeared-rivers? Can I guess you didn’t even bother to read the link you commented on? You can make such a guess but you would be mistaken. I didn’t notice that there was a link. I’m colorblind. a possible reason for the slower speeds in the centre of the galaxy is the fact that there are so many of the gravitational fiellds colliding they slow each other down however further out there isnt as many disruptions in the orbit so it goes on like usual. another explanations comes on the rule that matter cant be created or destroyed only change form. it is possible that with less gravity the leftover force from the gravity is converted into speed. if gravity warps space and time, then because the gravity closer to the centre of the galaxy is stronger then the space is expanding so in reality, space closer to the centre of the galaxy is actually bigger than the space further away. it also could explain the universe’s rate of expansion having strange inconsistencies. the gravity near the “centre” of the universe is is changing constantly because of fluctuations in what enters it. the only reason space could be infinite but yet expanding is that if the gravity near the centre of it is increasing its only our perspective that the universe is expanding. space is simply being warped so it only seems like it is expanding. puppyocam, now you are a thinker! Great answer. If u observe say Hoover dam, you notice the water coming in to large pits under the surface which take the water and release it through smaller release outlets on the opposite side of the holding structure. So to may it be possible in our universe that larger black holes are taking in matter, which is then being released through smaller portals on the outer edges of our central or seen matter center. Of course this implies another dimension that we haven’t discovered. Just my theory of a self sustainable, regenerative, universe. My belief is that black holes convert normal mass to dark energy and that there was once a lot more normal mass. Quasars are a result of quarks and such shooting away from black holes. The gravity of their passing causes collisions of particles which produce X-rays. The galactic halo is partially a swarm of quarks that did not escape the gravity of the black hole.